An herb garden at home is ideal for the avid gardener or chef. Herbs may also be used for medicinal or aromatherapy purposes. 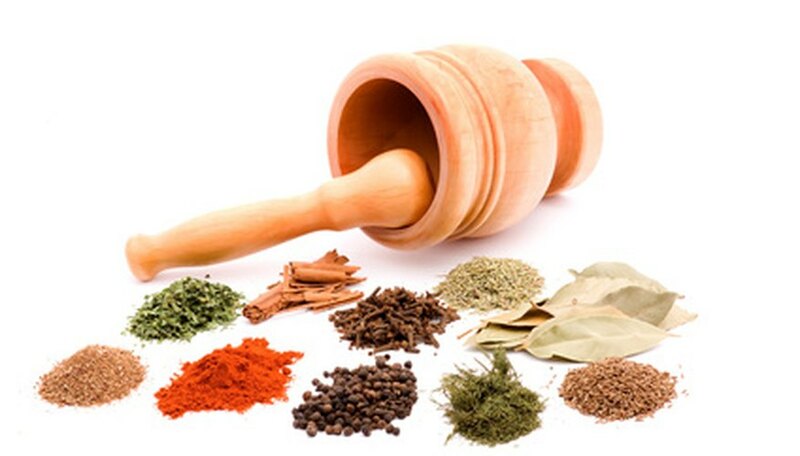 When growing herbs and spices, it is ideal to start with the best quality seeds or transplants. For small herb and spice gardens, growing them indoors helps you control the environment for the optimum quality. Purchase the spices and herbs from a reputable organic herb nursery as transplants if possible. Common varieties to grow at home includes basil, chives, mint, oregano, lemon verbena, coriander, lavender, rosemary, sage and thyme, according to West Virginia University Extension. Lay small pieces of the mesh over the planter pot drainage holes. Layer 1 inch of gravel over the screen. On top of the gravel, layer a mixture of equal parts well-draining potting soil, sand and compost. Fill the pot a little more than half full. Both WVU Extension and the Savvy Gardener online newsletter recommend adding 1 tsp. of lime per pot, as herbs prefer non-acid soil. Sprinkle water on the soil to dampen it, and create a shallow hole. This prepares it for the transplants. Take each herb or spice pot that holds the transplants, and carefully turn it on its side. Grasp the base of the plant with one hand and gently slide it out of the pot. Set the transplant into the hole. Water the herbs and spices deeply until water runs out of the drainage holes. After the soil settles, add more on top until the pot is full. Keep the planter pots either indoors or outdoors where they will receive at least five to six hours of full sun every day. Water the spices and herbs each week, one to two times depending on what each plant needs and your climate. Be careful not to overwater the herbs. Fertilize the plants every week during the growing season. Fish emulsion provides the proper nutrients for spice and herb plants, and the applied amount depends on the plant and variety of emulsion. Wearing gloves, work the emulsion around the plants base, incorporating it thoroughly into the soil without directly touching the plant. Harvest the spices or herbs with small scissors. The harvesting method depends on the plant, whether you have to harvest leaves or sprigs and the maturation time. Don't cut away more than a third of the herb plant. Perennial herbs will do better if they are taken outdoors during the summer months, advises WVU Extension. Keep them away from heating or air conditioning units, cooking fumes, or fluctuating heat in a kitchen.